Nearly 200 couples who feared their wedding ceremonies were not legal are to get a personal copy of a High Court ruling that they are lawfully married. The 193 couples were wed at Langtons Register Office in Hornchurch, Essex, before it was realised Havering Council had failed to renew the licence. All were married between 23 October 2004 and 24 March 2005. Mr Justice McFarlane was asked to rule on the status of the marriages and on Tuesday declared them all legal. Allan and Sarah Flight represented all the couples at the court and were told by the judge: "May I congratulate you on having an undoubtedly valid marriage and the same goes for all of the other couples who are in court today." Geoffrey Mott, representing the London Borough of Havering, who petitioned the court for a declaration of validity of the marriages, said there had been no approval under the Marriage Act to use Langtons for weddings between those dates because of "an unfortunate administrative error" by the council. But for the marriages to be invalid, all the parties involved would have had to have been aware that the Marriage Rooms were unlicensed at the time, he said. The couples had been assured by the council their marriages were legal. But it was decided to seek a declaration from the High Court because of the fears of some of the couples about their marital status. 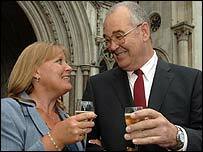 Mr Justice McFarlane said: "In something as important as this, each couple is entitled to have its own piece of paper. "The consequences for each of these couples over the past 12 months or more was an understanding that there may be a question mark over the validity of their marriage. "It left an anxiety and concern about where they stood in relation to their marriage and it is entirely right that the local authority should apologise to them." Mrs Flight said: "To declare our marriage valid takes all doubt and confusion away. We can now enjoy the rest of our married life together."